Recently a “new born” Christian expressed concern that “everyone” in his church, beginning with the pastor, concluded public prayer with the innocuous phrase “in His name. Amen” instead of “in Jesus’ name.” In his young Christian walk, he had been taught we should always pray in the name of Jesus, but this was not what he was witnessing in his church, and he was offended. I encouraged him to try not to judge because we cannot know the true motives of the person voicing the prayer; that judgment belongs to God, but I also encouraged him to follow through on his conviction, and when he has opportunity to voice a public prayer, to boldly pray in Jesus’ name. Following my counsel to this young Christian, I thought about what he had said, and I recalled observing the same thing in my own Christian circles. I often hear those who I believe are strong Christians pray publicly – even among other Christians – and close their prayer with the generic “in His name we pray.” Why is that? In whose name are we praying? “His name” could be George, or perhaps Francis of Assisi. Now, I have heard many people pray that way when they are in a “mixed” crowd. Perhaps they do it to be politically correct and not offend someone who does not recognize Jesus as God, but why do it in church or among other Christians? To me, prayer is simply carrying on a conversation with the Creator of the universe. What an awesome privilege we have to do that! Paul encourages us to “Pray without ceasing” (1 Thessalonians 5:17). How does one do that? Well, how do you carry on a conversation with a close friend or relative? How do you talk with your spouse? A conversation with God should be no different, albeit more reverent and respectful – after all, you are speaking to God. I speak to God all day long, and it does not require that I bow my head and close my eyes, or that I voice my prayer audibly. God knows our thoughts (Psalm 139:4), and He cares about every detail of our lives. No one else may care about the terrible traffic you face on your daily commute, but God does, and He doesn’t mind hearing about it. So, prayer isn’t something mystical that need be approached with some magical manipulative formula. Just talk to God! But there are those occasions when we need to have more than a casual conversation with God. There are needs that come into our lives or the lives of those for whom we care. Perhaps we have a friend or a loved one that is lost and in need of the Savior. Prayer may be needed for some ministry effort. Naturally, God knows about and cares about all of these needs, but He wants us to care about these needs just as He does, and He wants us to talk to Him about those needs. Perhaps He wants us to join Him in the effort to meet those needs, and He will not impose those things on us unless we care about them too. When we talk to Him, He speaks to our hearts as well. But when we pray about these things, Jesus says that we should ask all these things in His name. “Ye have not chosen me, but I have chosen you, and ordained you, that ye should go and bring forth fruit, and that your fruit should remain: that whatsoever ye shall ask of the Father in my name, he may give it you” (John 15:16, emphasis added). It should be obvious that this is not meant for frivolous requests like: “my house needs a new roof,” or “I need new tires for my truck” or “Lord, won’t you buy me a Mercedes Benz?” (I threw in that last one for those who might remember Janis Joplin. 🙂 ) Notice that Jesus called us for a purpose “that ye should go and bring forth fruit.” “And whatsoever we ask, we receive of him, because we keep his commandments, and do those things that are pleasing in his sight” (1 John 3:22, emphasis added). “And this is the confidence that we have in him, that, if we ask any thing according to his will, he heareth us” (1 John 5:14, emphasis added). Part of that will is that we pray in Jesus’ name. The name of Jesus is powerful when invoked. Following Jesus’ ascension into heaven, the first miracle performed by the Apostles was when Peter healed the lame man at the Temple by praying in the name of Jesus: “Then Peter said, Silver and gold have I none; but such as I have give I thee: In the name of Jesus Christ of Nazareth rise up and walk” (Acts 3:6, emphasis added). Paul cast a demon out of a young woman by calling on the name of Jesus: “Paul, being grieved, turned and said to the [demonic] spirit, I command thee in the name of Jesus Christ to come out of her. And he came out the same hour” (Acts 16:18, emphasis added). “And whatsoever ye do in word or deed, do all in the name of the Lord Jesus, giving thanks to God and the Father by him” (Colossians 3:17, emphasis added). “Is any sick among you? let him call for the elders of the church; and let them pray over him, anointing him with oil in the name of the Lord [Jesus]” (James 5:14). So powerful is that name of Jesus, that it should not be uttered carelessly. Paul called the Corinthian church on account of an incestuous marriage between a man and his father’s wife – probably his stepmother. Paul instructed the church to withdraw fellowship from the couple if they would not repent and further, “In the name of our Lord Jesus Christ, when ye are gathered together, and my spirit, with the power of our Lord Jesus Christ, To deliver such an one unto Satan for the destruction of the flesh, that the spirit may be saved in the day of the Lord Jesus” (1 Corinthians 5:4-5, emphasis added). Without doubt, these people were saved, but were living in sin that damaged the testimony of Jesus Christ; therefore Paul called for prayer that God would punish them harshly, perhaps even by premature death, rather than have such sin infect the rest of the church (1 Corinthians 5:6). But notice that the power is in the name of Jesus. 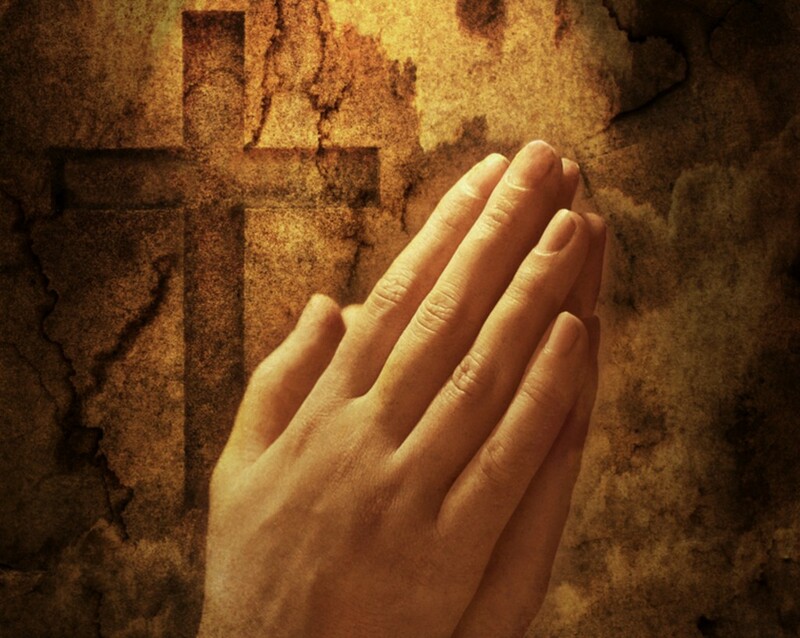 So, there is no magic formula for prayer, but if the prayer is of a serious nature, something that requires Divine intervention and something that is in accordance with God’s will, it should be asked in the name of Jesus and not just “in His name,” but “in the name of Jesus Christ our Lord.” This is true for all of our petitions to God, but more importantly, when praying publicly where others can hear. You cannot know who is listening to your prayer. “His name” informs the hearer of nothing. They may not know who “He” is. I would further exhort all believers when called on to pray in public in the hearing of a mixed audience, do not be ashamed to invoke the name of Jesus loudly, and boldly. Recall Jesus’ words: “Whosoever therefore shall be ashamed of me and of my words in this adulterous and sinful generation; of him also shall the Son of man be ashamed, when he cometh in the glory of his Father with the holy angels” (Mark 8:38). Pray in Jesus’ name. My husband was- and is- a lot like your young friend. It bothers him when people don’t seem to want to utter the name “Jesus”. I have heard (a few years back) that it is still acceptable in most circles to say the name “God”. It’s generic enough to be nearly all inclusive. But when you say “Jesus” you are narrowing things down by quite a lot. So, it takes more courage to say Christ’s name. Plus, there’s more spiritual resistance, even in our church if we don’t deal with it intentionally.